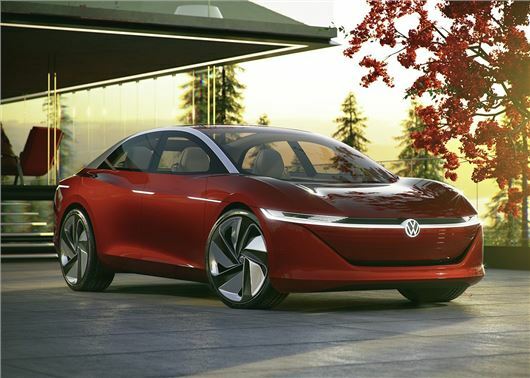 Volkswagen has given glimpse of its future models, with the unveiling of the I.D Vizzion concept. All-electric and driverless, the hatchback will be one of the first to be operated by voice and gesture controls only. Despite the sci-fi connotations, Volkswagen is adamant that the I.D Vizzion is a realistic concept. In fact, it claims that some of the electric and driverless tech will make its way into its new wave of I.D models, which will reach the UK in 2020. Classed as a 'level five' autonomous vehicle, the I.D Vizzion has no steering wheel or driver’s seat. Instead, it has four large seats that can swivel round to create a lounge effect. It can also automatically detect its surroundings on the road, via laser scanners, sensors, radar and cameras. Volkswagen claims that level five autonomous cars - like the one seen here - will be a common sight on Britain's roads by 2025. The electric powertrain comprises of twin-motors and a 111kW lithium-ion battery, placed under the vehicle floor. The I.D Vizzion will cover an official 413 miles from a single charge and 0-62mph will take a respectable 6.3 seconds. Volkswagen hasn’t released any details on charging times. Capable of recognising its owner by scanning their face, the vehicle will give its "guests" the full chauffeur driven experience, with the electric doors automatically opening to reveal a cabin bathed in mood lighting. Getting in and out should be easy – there are no B pillars – and the lounge-like interior features a noise cancelling system to filter out road noise. The windows can also be electro-chemically darkened so the occupants can watch a film or go to sleep. As well as driving itself and tailoring ventilation, media and lighting to match pre-programmed profiles, the I.D Vizzion also has the ability to ask its passengers if they would like to stop at a cafe or order drinks to go, while automatically paying for it. As well as featuring space for four adults to relax, the on-board computer will also have four travel modes, with relax, work, play and communicate themes. The business mode, for example, will transform the car into a mobile video meeting room, with the touchscreen controls providing one-touch access to email, presentation slides and online documents. Likewise, the relax mode will extend foot rests for the seats and play soothing music. While car buyers will ultimately have to wait until 2025 to see if the I.D Vizzion does indeed become a production reality, Volkswagen has pledged to launch I.D models in 2020, with the first expected to be based on the van-like Buzz concept.